Author: Ansie Hoff. Series edited by: Rainer Voßen. 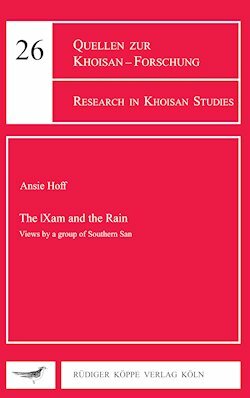 This publication deals with the role of water and rain in the historical and changing cosmology of the |Xam, an ethnic Group of South Africa, and their descendants. Therefore, the author did a culture-historical reconstruction, including the study of historical documents, oral information of |Xam descendants and own observations in the Northern Cape province of South Africa. To the |Xam, rain/water is more than only an element to quench thirst. Like many other groups, the |Xam experienced the universe as a life-force order of which the components influenced one another. Rain/water was viewed as beneficial but potentially dangerous and was symbolised in the attitudes and behaviour of an extremely potent female or male mammal such as the Water Eland and Water Cow or Bull, or a snake (the Water Snake). Descendants of the |Xam still live in the Northern Cape. Although the composition of the inhabitants in the research area prior to the eighteenth century is not clear, it was probably inhabited predominantly by San. Possibly, from about 1740, Europeans, Korana, Griqua and Xhosa-speaking persons moved into the area. Much biological and cultural contact occurred between these groups and subsequently, the |Xam lifestyle and belief system has undergone substantial changes. Many cosmological views have disappeared, others have changed or have been replaced by new ones. Examples from the recent past are the prominence of the male Water Animal compared to the female form, and the confusion about concepts such as the Water and Underwater People, Water Man, Water Maiden, people caught by the Water Animal, and the Water Spirit.